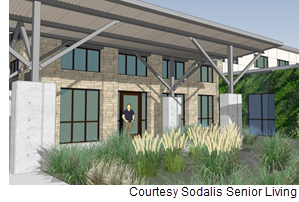 ​​​​ ​COLLEGE STATION – Sodalis Senior Living will break ground on Sodalis College Station on Oct. 24. The 73,777-sf assisted-living and memory care community will be at 3211 Harvey Rd. It will offer a mix of one-bedroom and studio residences. Delivery is slated for late 2019.